Following in the footsteps of Pele and David Beckham, Thierry Henry has arrived in the United States as a soccer missionary and scoffed at the notion Major League Soccer is a retirement fund for players in the twilight of their careers. Like his famous predecessors, the Frenchman has become an instant poster boy for the sport after joining the New York Red Bulls on a four-and-a-half season deal. The 32-year-old French striker said this would be his final contract as a player, but the former World Cup winner said his motives were clear. "I can assure you that I came here to try to win," he told a news conference on Thursday. "That is the most important thing. I'm a competitor, and I'm sure the boss will put a team out there to be sure that we can do it," he added. 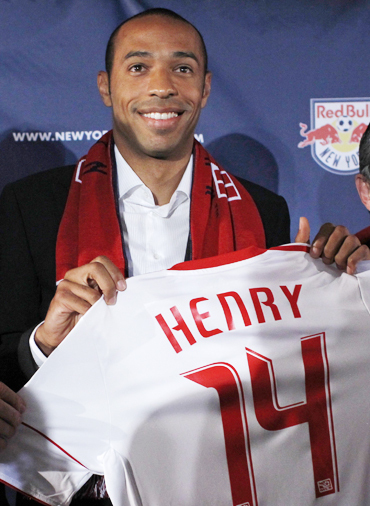 Henry was taken on a whirlwind trip around New York's major television networks before receiving his number 14 Red Bulls soccer jersey at his new home ground in Harrison, New Jersey. Flanked by club officials and MLS commissioner Don Garber, Henry arrived at a packed news conference to the backing vocals of The Beatles and the endorsement of his new organization. The Red Bulls' Swedish coach Hans Backe said he expected great things from Henry, who spent the past decade plying his trade with Arsenal and Barcelona. "I would rate him ... in the top 10 ever in the (English) premiership as a striker," Backe said. 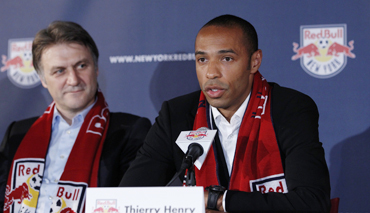 "He's very hungry to give Red Bulls their first premiership," he added. While Henry has achieved almost every imaginable honour in the game, winning a World Cup and European championship with France as well medals and plaudits with his clubs, he arrives in the United States after a lean past 12 months. Injuries restricted his appearances for Barcelona and he was also relegated to the substitutes' bench during France's ill-fated World Cup in South Africa where they failed to make it past the group phase. "I actually would like to know myself what went wrong," he said of France's World Cup display. "We didn't perform. As simple as that ... it was a sad one for the fans and for the country, but I think we should move on now," he added. Henry, who also announced his retirement from international soccer on Thursday, said his decision to move to New York was unrelated to France's World Cup showing and that he had been in talks about the transfer for months. 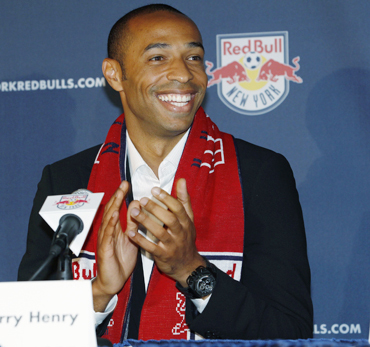 The Red Bulls are hoping Henry will not only help lead the team to a first MLS title but also attract new fans, something that could be tough given New York's large Irish community and Henry's double-handball that allowed France to qualify ahead of Ireland for this year's World Cup in South Africa. "I've already talked about that," he said. "There's nothing else I can say," he added.